Oh hey there, happy Friday! This Friday is especially crazy for me because I'm turning THIRTY tomorrow!! Like what?! I still sometimes think I'm 25 (and only recently realized I'm definitely not 21 anymore!) so I really can't believe it. I've never been one to freak out about age and will happily tell anyone how old I am, so I didn't really think turning 30 was a big deal. Then last weekend all of the sudden it hit me - I'm getting old y'all!! Anyway, here are some of my finds for this week. 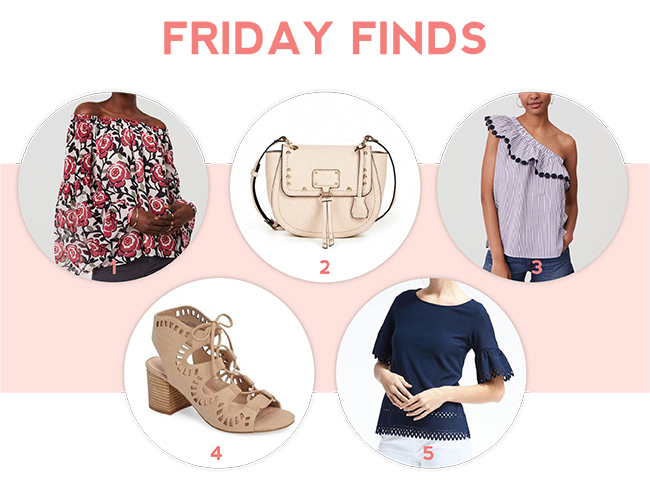 I'm absolutely dying over some of LOFT's new arrivals - how gorgeous is that floral blouse?! I'm also going to have to order that one-shoulder top. I have a feeling it isn't going to work on me but I can't just not try it on, you know, just in case.